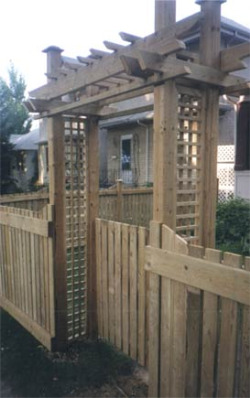 R N M Fencing has been building all types of fences in Winnipeg, Manitoba for over 16 years. We construct fences & decks for residential, commercial, and industrial properties. We offer wood and chain link fences. We also offer other outdoor structures including arbors/trellises, picnic tables, playhouses, storage sheds, chairs and benches. If you are building your own fence, we offer posthole drilling and setting and custom post cutting. Whether you are looking for a custom-built cedar fence for your residence or a bumper fence for your business, R N M Fencing is the company that’s right for you. During the winter months R N M Snow Removal offers snow removal services for properties of all sizes. If you have any questions about any of our services that aren’t answered on this site, please contact us and we would be glad to help you!